I didn’t vote for Obama, mostly because his ears were too big and he reminded me of Ross Perot. As it turns out my irrational fear of leaders with big ears worked out in my favor, you can’t blame me for the huge deficit and the fact that our tax money paid bonuses for banking executives. Michelle Obama has thus far been known for being married to the leader of the free world and for being a snappy dresser. Apparently, the dude responsible for at least some of her duds is designer Jason Wu. 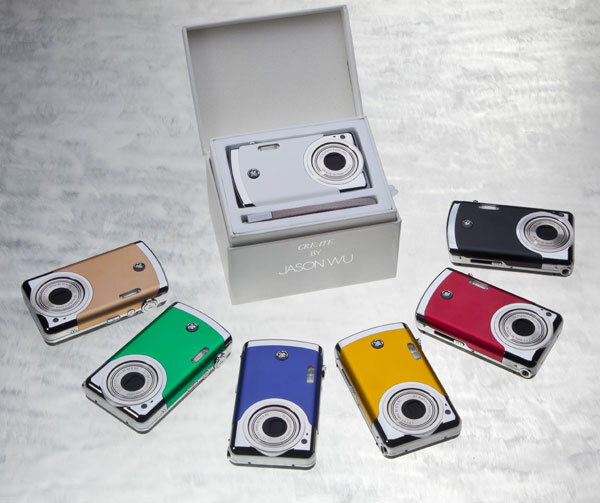 Wu has branched out from dressing Michelle and is now designing digital cameras, which is apparently what all designers aspire to after Vivienne Tam broke into the lucrative gadget design market and opened the doors for designers of all kinds. Wu’s line of cameras is called Create by Jason Wu and will be GE branded though they are produced by a company called General Imaging. The cams come in enough colors to make a bag of Skittles jealous or you can get them clad in leather. All of them share the same features and price. The cams come with 4GB of storage built-in, 12-megapixel resolution, 3x zoom, and a 2.7-inch LCD for $179.99 (USD). You can also get the cams in 8GB capacity for $229.99. You can get both of the cams on HSN on March 16.